Hello, gentle readers, and welcome to the RPG Reload, the weekly feature where we keep marching on, all through the night, exploring RPGs from the App Store’s past. It’s a little bit of revisiting, a little bit of recollecting, and a whole lot of rambling. I try to cover a broad range of RPGs, but just to make things interesting, once per month, you, the reader, get to make a leap into the decision-maker role to set right what once went wrong. In fact, this week’s feature was selected by the readers. If you want to cast your vote for the next reader’s choice, which will be in RPG Reload 013, please take to the comments section below or pop into the Official RPG Reload Club thread in our forum. You can also leave your thoughts on the games I play or anything RPG-related you’d like to discuss. Let’s enjoy a conversation together, joined by our mutual love of beating imaginary monsters with heaving swords made of math. This week, we’re taking a look at Lunar: Silver Star Story Touch ($6.99), which just recently got a long-awaited update that I think has it back on many people’s minds. This game has a long, twisty, and sometimes messy history to it, and whenever I think of this franchise, I can’t help but think what a massive missed opportunity it all was. Lunar‘s history starts around 1991-1992, in early CD-ROM times, and in many ways is a reflection of that period’s fascination with the new-found freedom the CD offered. The SEGA-CD add-on for SEGA’s Genesis had just arrived in Japan, and various developers were trying their hand at projects that took advantage of it. Game Arts, at the time a company best known for their white-knuckled action games like Thexder and Silpheed, wanted to try their hand at a traditional RPG, albeit one that took full advantage of the many benefits CD technology provided. They went all-out, collaborating with a newly-formed developer named Team Alex, made up of former Nihon Falcom employes and dedicated to developing the game. They hired on the services of novelist Kei Shigema and animation director Toshiyuki Kubouka to ensure the game would have a good story and the look and feel of an anime production. The team of musicians, including a young Noriyuki Iwadare (now best known as the composer of many of the Ace Attorney series from Ace Attorney 3 onward) were tasked with creating a soundtrack worthy of the CD medium, complete with an opening theme sung by Mayumi Sudou. In addition, a cast of professional voice actors was hired for 15 minutes of spoken dialogue. One amusing bit of trivia is that both the hero, Alex, and his love interest, Luna, were voiced by the same person in the Japanese version. On the Western side, the translation was handled by Working Designs, a fairly small publisher who had prior experience with CD-based games on the Turbo-CD platform. Working Designs saw the potential in the game and gave it their strongest effort to date, working with Team Alex and Game Arts to make gameplay changes, and making a lively, if somewhat controversial, localization packed with pop culture references and humor. The opening song was rewritten in English and sung by Shiya Almeda, and it’s a wonderful little slice of 1980s anime cheese that I’m going to stick just below for your viewing pleasure. The English voice cast actually had little prior experience in voice acting, consisting mostly of friends and associates of Working Designs, but for the time, they did a decent enough job. The main standout was John Truitt’s performance as Ghaleon, probably the most important character in the Lunar series. Topping that all off, Working Designs put extra effort into the packaging, something that would become synonymous with their name almost as much as Lunar itself. All of that effort on both sides paid off handsomely. Lunar: The Silver Star was the highest-selling SEGA-CD game in Japan, selling on a nearly one-to-one ratio with the hardware itself and likely pushing a great deal of its sales in that region. Overseas, it also enjoyed a great deal of critical and financial success, and in the end, the only SEGA-CD game that outsold it worldwide was Sonic CD (Free). This was at a time when Japanese RPGs were still struggling to make a dent in the Western market, too. Lunar was a hit, and where there are hits, there are sequels, and eventually, remakes. Lunar: Eternal Blue followed a few years later and performed almost as strongly as the first in Japan, ranking in at third place on the lifetime SEGA-CD software charts. The sequel included many improvements that had the team chomping at the bit to go back to the first game and remake it on newer hardware. This remake, Lunar: Silver Star Story Complete, is the version that is probably the most famous for English gamers, though it followed a pretty complicated road behind the scenes. Initially, it was released in 1996 for the SEGA Saturn in Japan, with a re-release several months later that took advantage of the recently-released MPEG expansion cartridge to display the game’s new animated cut-scenes in full-screen instead of a postage stamp-sized window. Working Designs, still fairly close with SEGA, intended to bring it out overseas, but after a rather nasty falling out with SEGA of America, the plan was scuttled. Apparently at the strong urging of Working Designs’ Victor Ireland, a PlayStation version was created and released in Japan in 1998, and this version would eventually find its way into the hands of extremely patient English gamers. It’s a very extensive remake, by any account. The graphics were substantially improved, the music was virtually all new, four times as many characters were voiced, more cut-scenes were added while existing ones were redone, and major changes were made to both the story and the gameplay. 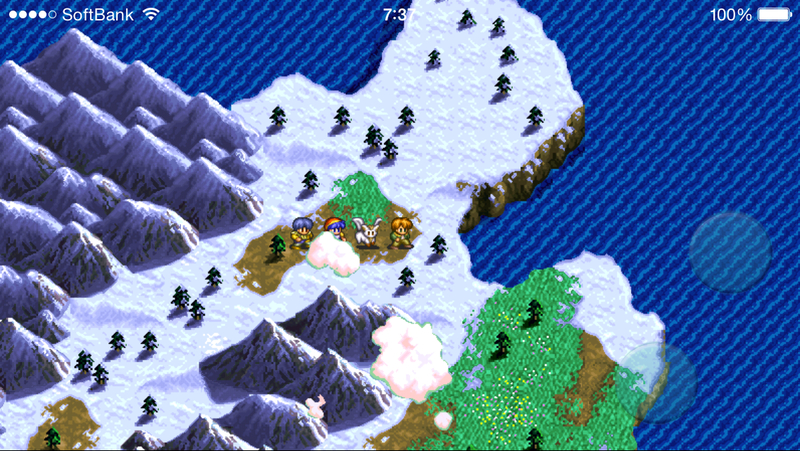 Random encounters were thrown out in favor of visible enemies on the map, dungeon and town designs were shuffled around a bit, and Eternal Blue‘s auto-battle option was carried forward. The story had a few big additions, with two new villains, some rewrites on Ghaleon’s character to help set up his arc in the sequel, and most significantly, having Luna come with Alex on the boat instead of staying back home waiting to be kidnapped. The Japanese voice cast was completely replaced, while the English cast returned, more mature and considerably more skilled at their craft than before. Working Designs went all-out on the packaging, including a cloth map and a pendant that many a gamer probably still has in a dresser drawer somewhere. The remake was a smash hit, joining a very elite club of JRPGs not made by Square-Enix that sold well enough in America to earn the Greatest Hits distinction. A remake of Eternal Blue followed, and many murmurs and whispers of Lunar 3 went around. Would it be for Dreamcast? PlayStation 2? Sadly, as it turned out, it would be for nothing at all. 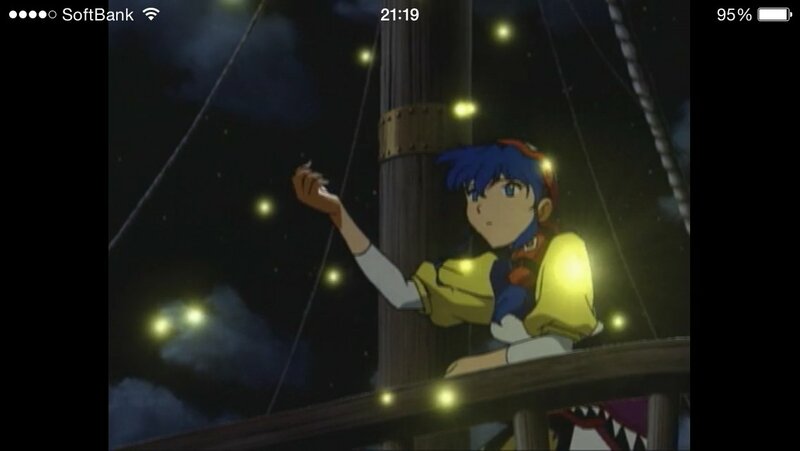 Game Arts largely moved on to the Grandia series, Working Designs went kaput, and Lunar fell by the wayside. A remake for the Game Boy Advance was released internationally by Ubisoft, followed by a truly dreadful original title for the DS called Lunar: Dragon Song. A fairly extensive remake for the PSP was released in Japan in 2009 by Gungho, the new owners of Game Arts, complete with a new prologue chapter that added more to the back story. XSEED announced they would release it in English, with a new voice cast and a retouched translation. It did fairly well, considering the PSP market at that time. 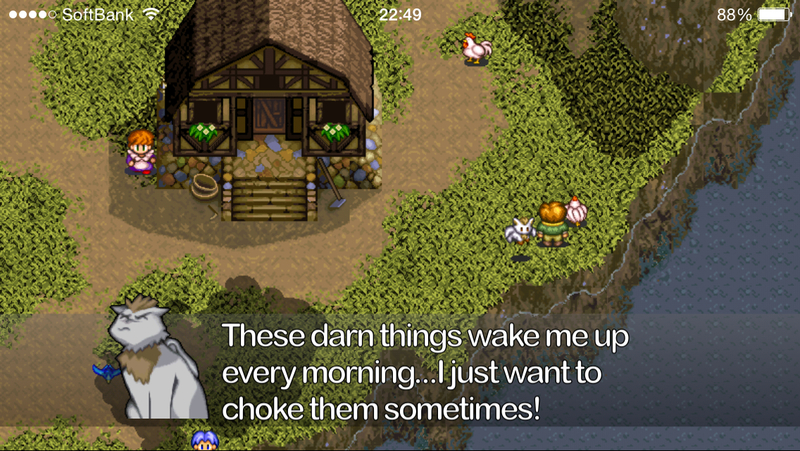 At last, our long story comes to the iOS version, released by SoMoGa in 2012. It’s essentially a port of the PlayStation Silver Star Story Complete, but with the translation and voice cast of the PSP Silver Star Harmony, for licensing reasons. It’s received fairly extensive updates, though in true Lunar fashion, players had to wait a while for the 2.0 patch that added iPhone 5 screen support, retina graphics, and controller support. You can play in landscape mode or portrait, and it has support for iCloud (take notes, Square Enix). It’s the only version of the game where you can play with Japanese audio and English subtitles, which is something I know is important to some people. It’s not the most elegant port, with a rather cheap-looking main menu and some fussy touch controls, but the developers have worked hard on fixing issues and taking people’s suggestions. To be frank, it’s a much better experience than the PSP version of the game, making it the best version of the game currently for sale anywhere. Enough about ports and remakes and history, though! Let’s talk about the game itself. Game Arts set out to make an RPG that felt like a proper anime, and they succeeded to a far greater extent than any developer before. It’s hard to express just how amazing Lunar‘s production values were to those who weren’t active in the RPG scene at the time. Lunar had a good story and told it better than most RPGs managed to, with amazing cut-scenes, voice acting, and a dynamite translation. All of this in 1992, when other RPG developers were still mostly nicking from Star Wars if they bothered with a story at all, and running the script through something worse than Google Translate on its worst day. Even at the time the remake came out in the USA in 1999, doing this stuff well was fairly uncommon. 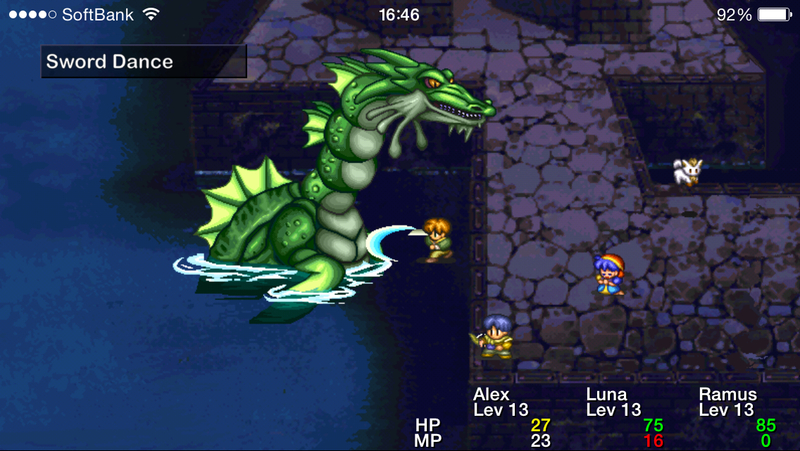 It’s no surprise, then, that compared to the relatively low-budget affairs that make up the bulk of the iOS RPG library, Lunar still comes off as a very stylish piece of work. That’s important, because in terms of gameplay, Lunar never had a lot of good ideas, and it hasn’t improved with age. The battles have one interesting point going for them, in that you actually have to close the distance with your enemies to attack them, instead of swinging at air to make numbers pop up over their heads. It gives attacks a much more tangible feel when your guy actually walks over and smacks the monster’s sprite. I also like how the HP of bosses scales with Alex’s level, ensuring you can’t just grind your way through everything. Aside from that, and I say this with a heavy heart and a deep breath, there’s not much separating Lunar‘s gameplay from a higher-end Kemco game. It’s all very standard stuff between the story bits, and I’m really not a fan of the dungeon designs in particular. This stuff bothered me a bit when I last played it 15 (!) years ago, but it’s really noticeable today. Still, it’s at least no worse than a Kemco game, so that’s some sort of consolation prize that I’m sure someone values. That said, if it has to ride on its story, it can. It’s not as special as it once was, and I’m not sure if I’m young enough anymore to buy what it’s selling the way I could 15 to 20 years ago, but the characters are very memorable, the script is top shelf, and the pacing is excellent. I remembered the game being really long, but it’s actually a zippy 25 to 30 hours, depending on how much clean-up you do. There’s a certain relentless optimism to it that has become increasingly rare in the post-Final Fantasy 7 navel-gazing JRPG world. The trope of the small-town kid looking for an adventure is extremely overdone at this point, but Alex is perhaps the best and most earnest of the lot, if you ask me. The biggest problem I have with Lunar‘s story is the same one I’ve had for a while now, and that’s that it’s just not as good without Lunar: Eternal Blue book-ending it. Lunar‘s story on its own is good, but particularly in its remade version, it lobs a few balls up into the air that it means to catch in the sequel. It pays off brilliantly, but unfortunately, that pay-off isn’t available to iOS gamers, and likely won’t ever be. The exact reasons aren’t known as to why Lunar: The Silver Star has been remade several times while Lunar: Eternal Blue hasn’t been revisited since the PlayStation release. SoMoGa has pursued it and was informed by Game Arts/Gungho that it wasn’t available. In all likelihood, it has something to do with outstanding issues with Team Alex, or what remains of it. Game Arts and Team Alex jointly held the Lunar IP, and their relationship ended in court, with Game Arts scoring a victory that ended up killing Team Alex in 2003 and dissolving most of the creative force behind the Lunar games. The Lunar IP itself is believed to be wholly owned by Game Arts/Gungho at this point, but the rights on the individual games might be more problematic. Whatever the reason, we shouldn’t expect Lunar 2 on iOS anytime soon, and that’s too bad, because it’s not only a great follow-up, it’s a better game all-around. 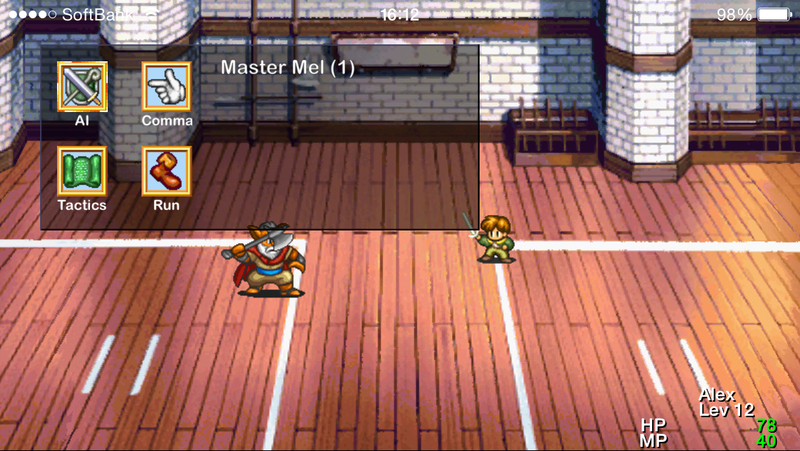 Even without its second chapter, Lunar: Silver Star Story Touch is an excellent game. The story was initially meant to stand alone, so don’t worry about it ending on a cliffhanger or anything. It’s a world worth visiting filled with characters worth getting to know, and if it comes off a bit generic at times, it’s important to remember that, at least in video game circles, it set down a lot of what are now considered cliches. 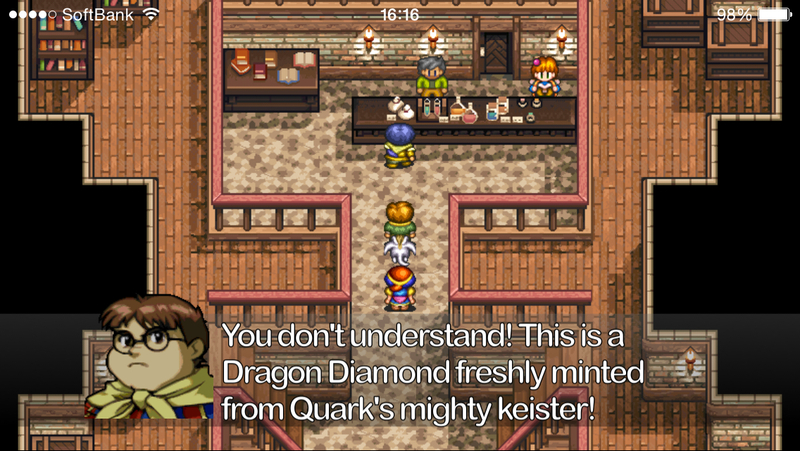 There are only a handful of JRPGs available on the App Store that have comparable production values to this 15-year-old remake, and of those, only one other one features hilariously anachronistic Austin Powers references. Plus, you have to hand it to SoMoGa for actually listening to player feedback and updating according to those requests. For me, though, this was a bit like trying on my beloved jacket I wore in high school. It smells familiar and it brings back so many memories to look at it, but putting it on makes me realize how many years have gone by between then and now, and it just doesn’t really fit me anymore. I guess that shows how games can have just as much of an effect on you as any kind of art. In creating a strong enough emotional connection, it became intrinsically connected to a very particular time and place in my life, and it’s hard for me to view it free of that baggage. I think it’s a rare sort of game that can make an impression like that. They say you can’t go back home again, but that doesn’t mean home isn’t a beautiful and special place, even if it’s not the place for you anymore. That’s just my take on the game, though. What do you think of it? You know the drill, leave your comments down below or slide on in to the Official RPG Reload Club thread to sound off on this classic. Don’t forget to cast your vote for the next reader’s choice feature while you’re at it. Going into October, I’m getting into the whole Hallowe’en spirit with my selections, so let’s enjoy a spooky month of RPGs together. Thanks for reading! Next Week’s Reload Hint: The new evil overlords, same as the Old Ones.